GREEN BAY — Packers QB Brett Hundley directed two scoring drives in the second quarter as Green Bay rallied to tie Saints at halftime, 10-10, on Thursday night at Lambeau Field. The Packers nearly got on the board early in the quarter. 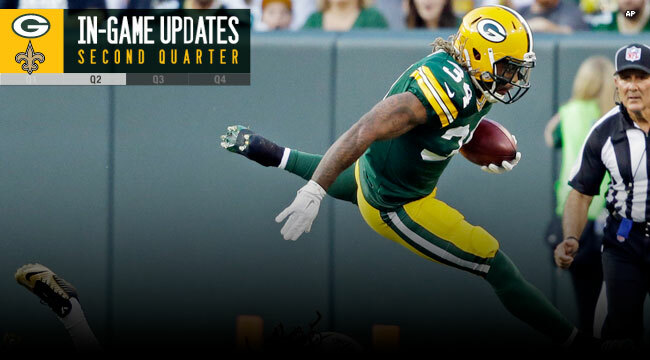 RB Rajion Neal ran for 12 yards to convert a third down on the first snap of the period, and two plays later, a pass to TE Andrew Quarless picked up another first down, putting the Packers in the red zone. QB Scott Tolzien’s next pass was picked off, however, as Saints CB Kyle Wilson stepped in front of WR Myles White, thwarting the scoring threat. Green Bay did get on the board on its next possession. The defense forced a punt, which WR Jared Abbrederis returned 17 yards — making three tacklers miss — on his first NFL touch of the ball. After a Saints sack on third down was wiped out by an illegal contact penalty, QB Brett Hundley connected with Abbrederis on a 6-yard pass on third down. The gain was short of the marker, but it set up K Mason Crosby’s 54-yard field goal to make it 10-3 with 4:56 left in the half. The Packers’ defense got another stop, this one with the help of a pressure and QB hit on third down by LB Jayrone Elliott, forcing an incompletion. Abbrederis returned the ensuing punt 10 yards, and Hundley’s 13-yard scramble gave the Packers a first down in Saints territory at the 2-minute warning. Right after the break, a screen pass to RB John Crockett picked up 22 yards, and WR Jeff Janis gained 7 on a crossing route. Janis then hauled in a 14-yard TD pass with 58 seconds left, and Crosby’s PAT tied the game at 10. Green Bay’s defense forced a quick three-and-out, but Abbrederis fumbled the ball on the punt return. A Saints penalty nullified the turnover, though, and New Orleans had to punt again. The re-kick went out of bounds, and Crosby tried a 66-yard field goal on the final play of the half. It came up short.